Europa is a book created by a group of Magnum photographers and journalists who have been covering both the refugee crisis in Europe and the many contexts across the Middle East, Asia, and Africa that gave rise to these migrations. This book is launched in partnership with the Arab Fund for Arts and Culture (AFAC) as the first project under its special program, the Arab European Creative Platform. 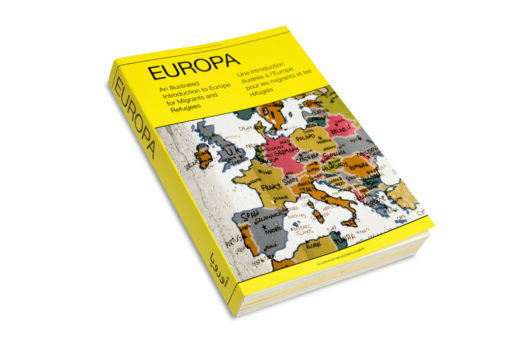 The book harnesses the collective energy, skills and resources of its contributors to create Europa, a collaborative and independent book, the first of its kind intended for practical use by migrants and refugees, and as an educational tool to inform, engage, and facilitate community exchange. Written in four languages – Arabic, Farsi, English, and French – the book offers an introduction to the motivations behind the creation of the European Union, how it developed, its current ethos, and the relevant debates that will determine its future. Through first-person testimonies, readers are also introduced to many of the different people who make up Europe today — from citizens to residents to immigrants to old and new refugees — who in their own words tell their stories of displacement, war, solidarity, and reconciliation.